Both Stephen and Brenton Grove remain upbeat and proud to have represented Team Australia in the inaugural FIA GT Nations Cup despite being robbed of a strong result in a first corner incident. 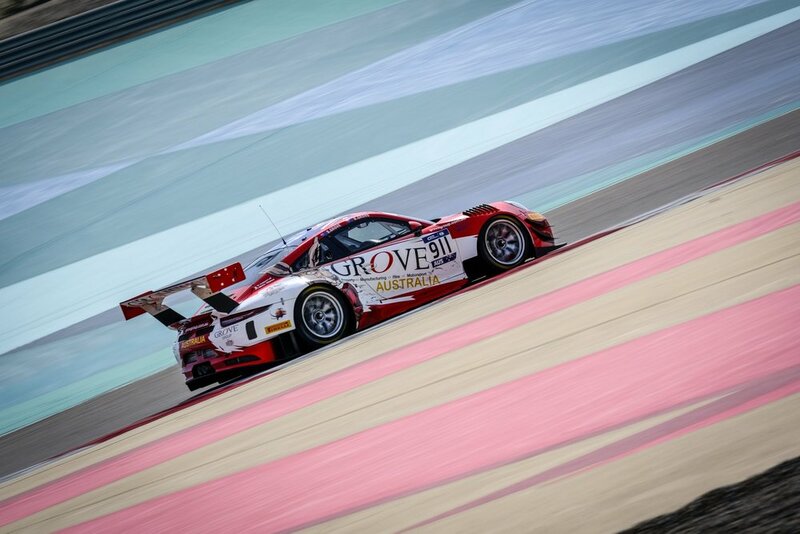 Up until that point, the Grove duo had made substantial gains and began to march towards the front of the field on debut at the Bahrain International Circuit and in GT3 machinery. Driving a Herberth Motorsport-prepared Porsche 911 GT3 R, the pair got their first taste of the car and track in the two 80-minute practice sessions on Friday; turning the most laps of anyone in the field. As they gained experience of the track and car, both drivers’ lap times improved significantly as expected, with Bronze-ranked Stephen getting down to a 2:04.9s in his Qualifying session, enough for 15th, before Silver-ranked Brenton punched in an outstanding 2:02.5s to finish 13th fastest in his hit out. Stephen handed the car over to Brenton well placed after making up positions in his stint during Qualifying Race 1. Brenton did an impressive job to hold off the Team China Porsche for 12th but was pipped at the last corner after the latter made a move on Brenton, as he crossed the line a narrow 13th. The junior Grove started Qualifying Race 2 and blazed his way up the order, with Stephen taking the car over in ninth, however, got shuffled back to 12th at the flag, showing strong pace during his stint on worn tyres. Carnage ensued at the start of the Main Race under the lights, bringing an early end to Team Australia’s bid for victory. While Stephen was looking to make up a few positions at the start, there was contact with another competitor at the first corner, leaving the car badly damaged and forcing him to retire to the side of the track. In spite of the unfortunate conclusion to the main event, both Groves thanked the efforts of the Herberth Motorsport team and reflected on the weekend and the experience as once in a lifetime. “It’s such a shame that the Main Race ended before it had really begun,” said Stephen. “All weekend the team had done a great job with the car and our strategy was really good. “I think we were in for a great result. Obviously there was a lot of carnage in the race and unfortunately, we weren’t able to avoid it. Brenton added: “Driving with dad was such an amazing thing to do. Obviously, the result didn’t end up the way we wanted it to, but we worked so well together and were a very competitive pairing.